Heat oven to 350°F. Trim fat from pork chops. 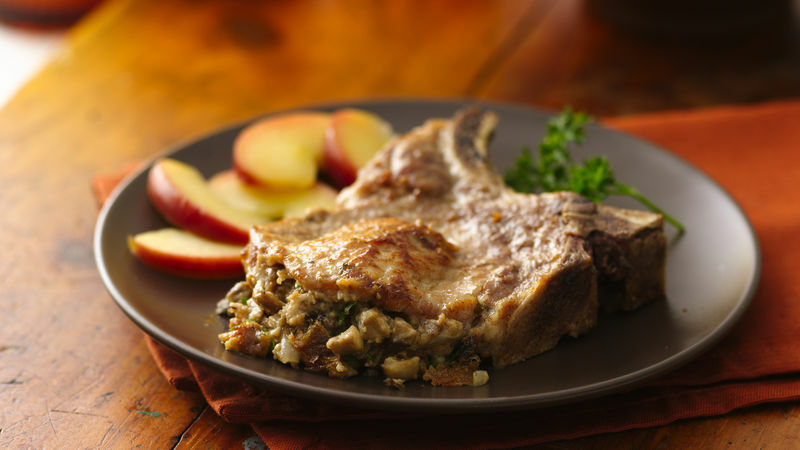 Make a pocket in each pork chop by cutting into side of chop toward the bone. In 12-inch ovenproof skillet, heat 2 tablespoons of the oil over medium heat. Cook onion, mushrooms and garlic in oil 4 minutes, stirring occasionally, until onion is tender. Stir in 1/2 cup of the broth, the bread crumbs and parsley; remove from heat. Fill each pocket with about 1/3 cup mushroom mixture; secure with toothpicks. In same skillet, heat remaining oil over medium heat. Cook pork chops in oil about 6 minutes, carefully turning once, until brown; pour remaining broth into skillet. Cover skillet with foil; bake 1 hour or until pork is no longer pink and a meat thermometer inserted in center reads 145°F. Remove toothpicks before serving.